Abstract : The presence of sequences of alternating quiescent ('down') and bursting ('up') states in NREM sleep neuronal recordings is well established across mammalian species . A striking related pattern of activity can also be observed in LFP and EEG recordings of anesthetized animals . However, the dynamical principles underlying such phenomenon are unclear. Some of the previous theoretical attempts to understand the neural basis of anesthesia effects have shown to be successful in replicating other remarkable characteristics of the associated EEG signals, e.g., the initial increase of the power spectrum and its subsequent decrease (in several frequency bands) during the process of the anesthesia induction [3-4]. 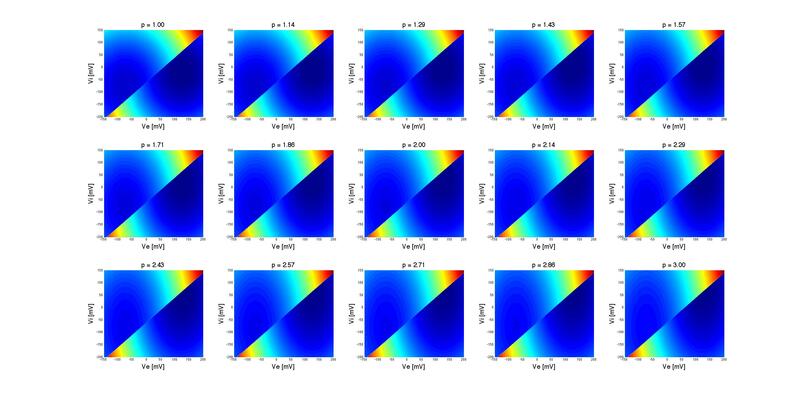 Interestingly, such models predict the existence of notable non-linearities in the behavior of the neuronal membrane potential, with more than two stable branches through which the dynamics may evolve as the concentration of the anesthetic agent (AA) increases. Noise-induced transitions between two attractors might then occur, a theoretical framework that could explain the observed alternating sequences of 'up' and 'down' states. An example of this scenario is shown in Fig. 1, where 'p' stands for the AA level, and the oblique line is the separatrix between the two basins of attraction. Nevertheless, the mathematical tractability of these non-linear scenarios is limited by the 2D phase space defined by the describing variables: the excitatory (Ve) and inhibitory (Vi) PSPs at excitatory cells. Exact solutions to these problems are only known for 1D systems and, consequently, the analysis of the existing non-linear models is typically avoided. In this work we undertake a first attempt to solve this task, by applying known techniques on stochastic phenomena theory  to the model proposed in . We consider the time the system spends in the 'up' or 'down' states as being similar to the mean exit-time needed to escape from the corresponding attractor.